As Obama touts his education reforms and neoliberals face off with teachers, hardly anyone is talking about the real problems besetting America’s public schools. 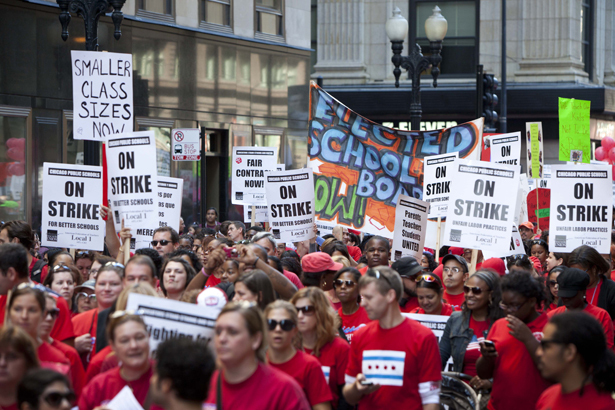 Even though the Chicago teachers’ strike is now settled, the issues it raised will not go away anytime soon. Many of the reforms the teachers oppose—expanding charter schools, using test scores to evaluate teachers, closing “failing” schools—were introduced by then–Chicago Schools CEO Arne Duncan, now President Obama’s education secretary. In fact, these measures have largely been incorporated into federal policy under Obama’s Race to the Top (RTT) initiative. Obama frequently touts RTT on the campaign trail along with what he regards as his administration’s other signal accomplishments in education policy: national common core standards adopted by forty-six states, the provisionally enacted Dream Act and more. The president has raised education as a campaign issue because he knows the American people are deeply concerned about it. The cutbacks in the wake of the recession have taken a heavy toll on schools. Thousands of teachers and other personnel have been laid off, class sizes have increased and critical programs—kindergarten, music, art, after-school programs, etc.—have been slashed or even eliminated. Obama deserves credit for allowing states to use stimulus funds to offset some of the effects of austerity, saving more than 400,000 jobs in education. However, his education policy has all along had two major weaknesses: his stance toward teachers and his unwillingness to acknowledge that the biggest challenge confronting public schools is poverty. What has happened in Chicago exemplifies those weaknesses. The district has been undergoing reforms consistent with Obama’s accountability agenda for several years now. But only 45 percent of Chicago public school students meet or exceed the Illinois learning standards. The city’s schools have some of the highest dropout rates in the nation. In 2011–12, of the 598 schools in the system, 443 did not achieve Average Yearly Progress for the second consecutive year. Clearly, something is not working in Chicago. It’s not just the reform agenda that’s at fault: the schools have been failing for a long time. Mayor Rahm Emanuel may be a bully and a threat to public education—and his remedies the wrong ones—but the call for change can’t be denied. The teachers have been bold in their denunciation of the high-stakes testing that has been used to rank students, schools and now teachers. But they have been less clear about what should be done to promote change and improvement. The union has raised the critical issue of student poverty by calling for more social workers and school-based clinics, but it has not acknowledged that more learning time and a clear and fair basis for judging teacher effectiveness are issues that must be addressed. § Youth poverty. Since 2008, poverty rates for children have soared. Nationally, one child in four comes from a family below the poverty line, and one in five lives in a state of food emergency. Increasingly, public schools are all that remains of the safety net for poor children, and with funding for education being cut back, the safety net is falling apart. § Changing demographics. In nine states, the majority of school-age children are from minority backgrounds. Because of higher birth rates among Latinos, the number of states with majority minority populations will steadily increase even if the influx of immigrants continues to slow. As the ethnic composition of student populations changes, it is harder to obtain public support for school funding. Voters don’t seem to understand that today’s children will be responsible for supporting an aging, largely white population during its retirement years. Economists project that it takes at least three workers to support one retiree on Social Security. Since 2010 we have fallen below that threshold. Will a less educated, poorer, multiracial workforce be willing or able to take care of an aging white population? § Growing segregation. According to UCLA’s Civil Rights Project, two in every five African-American and Latino students attend highly segregated schools. Schools are more segregated today than they were forty years ago. The pattern is most severe in Western states, including California—not in the South, as many people believe—and most nonwhite schools are segregated by poverty as well. Dropout rates and failure tend to be highest in the schools of poor children. How will the next generation of young people be prepared to solve the problems they inherit? The Chicago teachers deserve credit for challenging the neoliberal reforms and the drive toward privatization that have been promoted by Mayor Emanuel, Secretary Duncan and, to some extent, President Obama. However, shutting down a school system where the overwhelming majority of students are poor, black and Latino without offering a vision for comprehensive change is not sufficient. Parents have called for a seat at the negotiating table. Perhaps that will be what it takes to create schools that are accountable to those they serve. Also in this issue, Melissa Harris-Perry reveals the “Casualties in the Education Reform Wars.” In our special Occupy the Safety Net issue earlier this year, Pedro Noguera wrote about the struggles of a West Oakland school, hit by the double whammies of poverty and austerity.